All Is Well surpasses Memories of Peking to become the top drama on TV. The latter kept its momentum to reach a CSM55 high of 1.532% on its last week but proved to be no match for All Is Well which surged past 2% in ratings. Hunan TV's primetime drama Nice To Meet You may be lagging but it's not doing too badly having crossed 1% in ratings for the first time. Zheng Shuang's comeback drama Youth Fight averages with ratings of 0.5% upon premiere. All Is Well continues to lead online followed by web drama Heavenly Sword Dragon Slaying Saber in 2nd place. Yukee Chen joins leading man Joseph Zeng among the top 10 celebs. With competition so fierce on television, it's nice to see The Legends placing in 4th in online rankings. Yang Zi drops from the list for the first time in months, but she's still hanging on in 11th place. 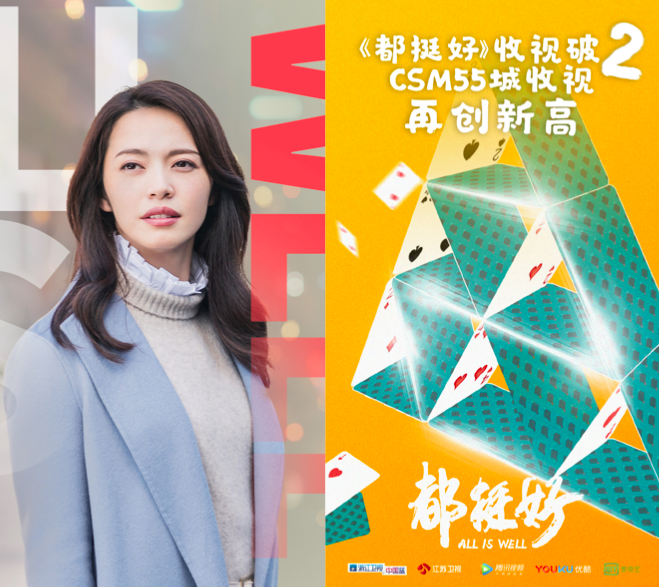 All Is Well leads CSM nationwide followed by Nice To Meet You on Hunan TV. *The above are mostly primetime shows that air at 19:30 while those highlighted in blue air at 22:00. **Rankings are overall rankings across the shows airing on the same night, regardless of air time. *** Reruns are not included. 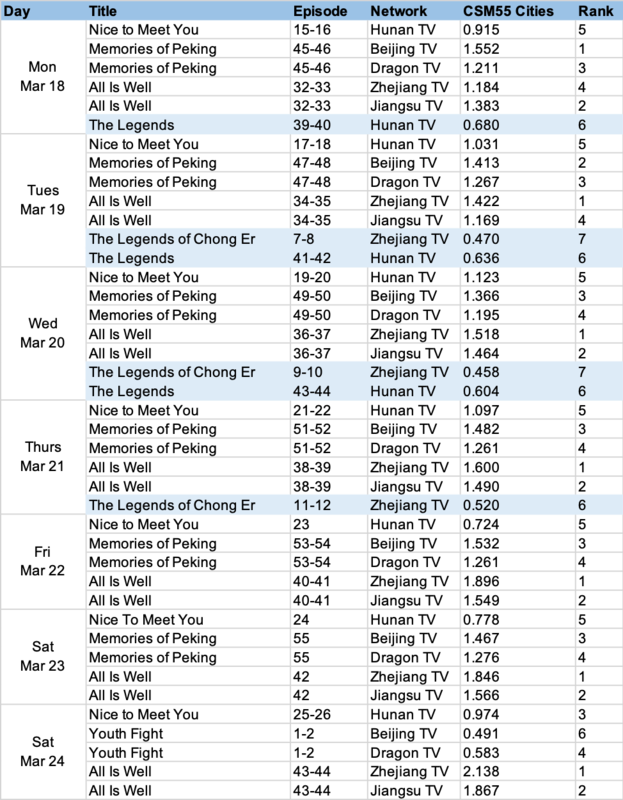 **** Dramas that air on CCTV (the state television broadcaster in China) are not included. ***** CSM55Cities and CSMNationwide are common tv metrics. *****Due to a difference source for the week beginning Mar 18, CSM Nationwide rankings includes reruns and CCTV. *View count is based on the six streaming sites (Youku, iQiyi, Tencent, LeTV, Sohu, Mango) ** Star popularity is based on view count, weibo, douban, tieba, search results, etc *** iQiYi and Youku no longer provide view count. Very well deserved for "All is Well". I loved the drama! I thought it was going to be one of those long dragged out boring Chinese Family dramas. But this drama is so awesome in that it touches all the topics that happens in a Chinese family that no one talks about outside of the immediate family. The actors/Actresses in this drama should all deserve an award for this drama. Very well made, scriptwise, actingwise, and overall shooting wise. Everyone should watch this drama! No Yang Zi but hang in there Deng Luns' name!! I am recommending All is Well to everyone i know. This is the first drama after AOL that can hold my attention beyond the first 2 eps. It is so good, the acting, the lines, the storylines, just top notch. i am a believer in Daylight ent products now. The celebrities list above, is it credible, it has Yao chen, li nian, Guo Jing fei from the drama but no Ni Dahong? The awesome, most hated but fascinated character in a drama ever...Ni Da hong is trending online much more than any of the above celebrities on the list. Funny how I was amazed at Yang Zi for still being in the top 10 for so long last week, and a week later she drops out of the list lol. I would've checked All Is Well out if there's subtitles available.